Piramal Museum of Art is a free entry, un-intimidating and refreshingly cool museum space that may alter your view on high-brow art shows. Designed to highlight Piramal Museum of Art’s meticulously unique and innovative approach to art display, this exhibition is curated and structured to appeal to the public on multiple levels. To this end, Piramal Museum of Art has worked with the globally renowned exhibition and museum designers, Gallagher & Associates. Their approach to visitor experiences is immersive, so the artworks have maximum impact whilst allowing the audiences to connect at a very personal level. The custom-designed lighting and interiors, compelling graphics, and interactive components, all supported by well-articulated content, creates a unique context and individual engagement opportunities for each visitor. 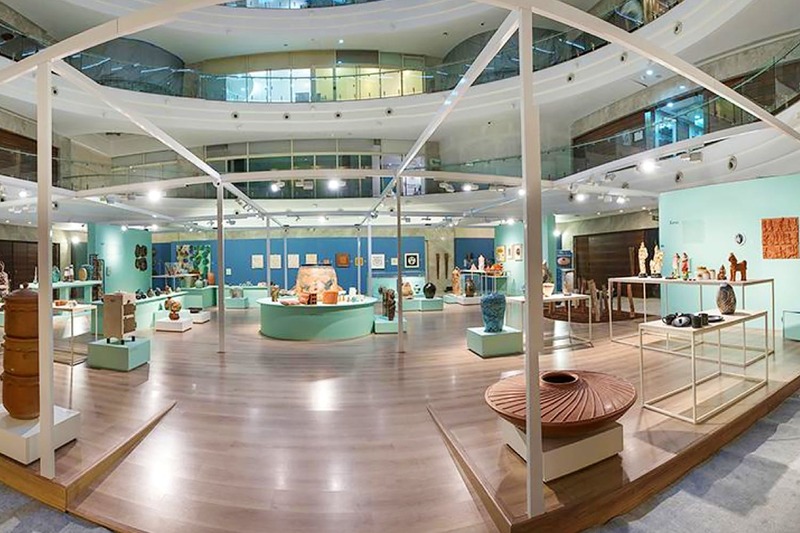 A first-of-its-kind exhibition in India, Piramal Museum of Art have taken inclusiveness and accessibility one step further with a disabled friendly exhibition space and special exhibits in braille for the visually impaired. When viewed from above, the entire exhibition space resembles a Raza painting. The overall takeaway is an engaging experience that you will surely remember. So, Why Is That Art? For most of us who are not familiar with the art, museums can be intimidating spaces where some of the most obvious questions about the works like “Couldn’t a four-year-old do that?” just lead to a dead end. Fully aware that art doesn’t usually provide its own context, Piramal Museum of Art have created a series of programmes for the public to promote understanding and appreciation, in an effort to make the exhibition fun and interesting for new arts audiences. Featuring key works from the Piramal Art Collection, S.H. Raza: Traversing Terrains traces the artist’s journey from French-trained landscape painter to one of India’s most celebrated abstractionists. On display are works from the early 1940s to the 1990s, showcasing a diverse body of work that amalgamates Raza’s classical French training at École des Beaux-Arts, Paris, with the Indian visual language of his heritage. The exhibition opens to the public from June 24 to October 28, 2018, at Piramal Museum of Art, Lower Parel, Mumbai. Whether you’re an art aficionado or not, Piramal Museum of Art is worth a visit for a refreshing view of an Indian Master.